Twitter requires all requests are authenticated. This means the user has to log in and give permission to use your app. It also means I need to now use OAuth which can be quite complicated for a newcomer. Support for JSON only. I used the XML file type as I was familiar with it, works great with LINQ and serialisation is easy. I’ve never used JSON before. Luckily I discovered JSON.NET which is fantastic and very helpful. 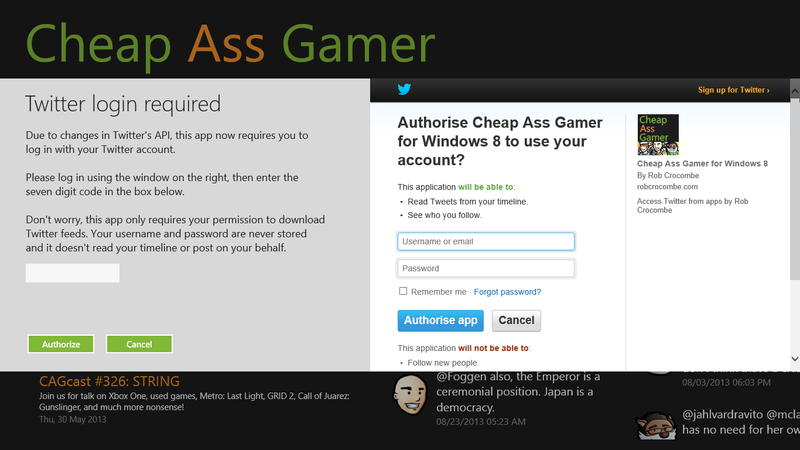 Because of this change, I have to completely rewrite the way the app downloads tweets and saves then in the cache. I’ve done some research and its been fun learning new ways to solve these problems. I’ve spent most of today writing new code for the app and hopefully version 1.3 will be ready soon. This version should improve the app’s experience as I’ve also squashed some bugs and will probably add roaming features so your credentials and current podcast info will be available across all your Windows 8 devices. Check the blog for more updates soon. UPDATE: If you’re interested in doing Twitter in your own app, this example is really, really useful.